If you’re anything like us at Boku Slots, then you’ll have a love hate relationship with snow and cold weather. Yeah, it’s kind of romantic and fun, but it can be a pain when you’re trying to get to work. 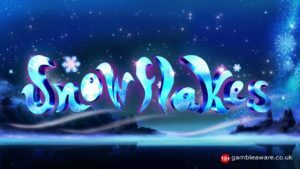 For the fans out there you’ll love the wintery setting of Snowflakes slot game, which is brought to us by the fabulous NextGen Gaming. 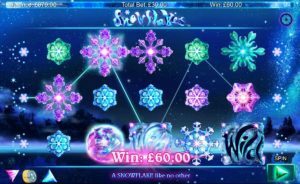 Snowflakes is a 5-reel, 25 fixed pay line slot, that has an RTP of 96.58% and some interesting features. Bet Amounts – Betting begins at 30p per spin and can be increased to a whopping £600 per spin if you wish. The bet amounts can be altered by going into the settings, or you can also change the bet amount directly from the screen. Wild Symbol – The wild symbol is depicted by the word ‘Wild’ frozen in an ice block. It will substitute for all other symbols except for the scatter. The wild is the second highest paying symbol in the game, giving you a win of 500x your stake amount if you land 5 or more on a winning pay line. Scatter Symbol – Your scatter symbol is what looks like a multi coloured iced disco ball; very glittery indeed. Land three or more scatter symbols and you will trigger the bonus spins feature game. The scatter is the highest paying symbol awarding 2500x your bet amount, if you land 5 or more across a winning pay line. Other Symbols – There are a range of beautifully designed snowflakes as your other symbols. The larger and more intricate ones are your higher paying symbols, with the lower ones offering a return of just 5x to 100x your stake amount depending on how many land on the winning pay line for you. 5 scatter symbols = 15 spins and 2500 coin win (x by bet amount). Icy Wild Feature – This feature is played within the main game and can be triggered at random. After the spin if the icy wild is triggered, up to 5 symbols will be turned wild. It will be 1 wild per reel, so this could be well worth your while. Wild Wind Feature – Again this feature is awarded randomly and can be triggered at any point in the main game. Just like the previous feature up to 5 wilds will be allocated to the reels, one per reel for the completion of that spin only. There is a serious case of feature overkill within Snowflakes slots, why there is the need for two that do exactly the same thing we are unsure. However, we still really enjoyed the game itself, as the concept is simple and pretty to watch; if you like that kind of thing. The soundtrack is quite nice and not to hard on the ears, but let’s not forget those bonus spins which can be retriggered which is a feature everyone is going to love.